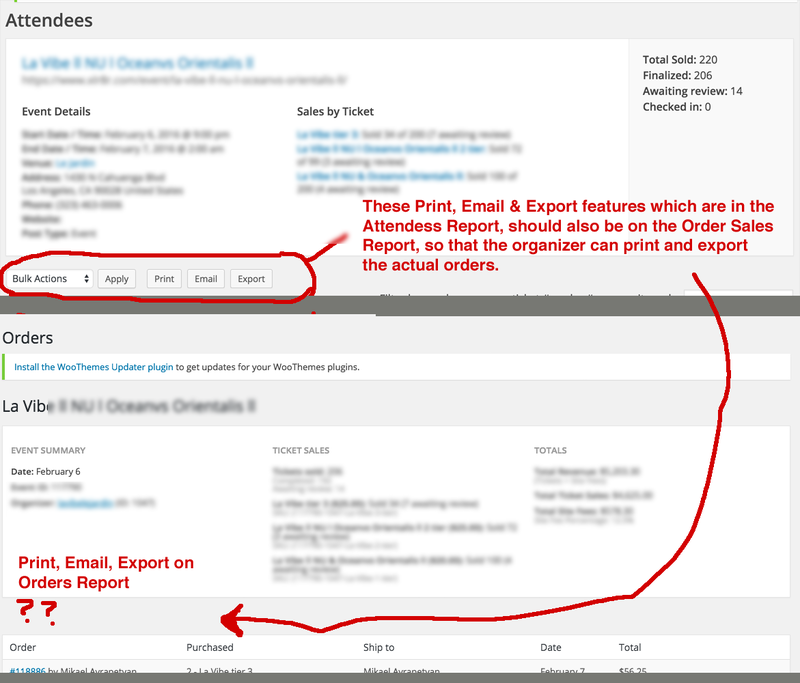 I would love to have community tickets being able to collect attendee information and have all the same functionality as if you were creating an event from the admin (set fields, use saved fieldsets) and all that good stuff the admins have. I think it's a bit tedious that someone submits an event with tickets but doesn't have any attendee information associated to that ticket. I feel like this feature should be automatic or should have implemented awhile back! It would be great if the Organizer can choose which taxes to apply if any to their event. So as they add a ticket price, they can add the tax rate. The tax rates would be chosen from the tax rate table in Woocommerce. Being able to request Additional Attendee Information is a fantastic feature we can use when creating a ticket. However as it stands only the admin can use this. My users who submit their events and request tickets on the front end have no way to use this feature. They have to contact me and I have to manually add it for them. Very time consuming and not practical for a large site. Request > Can this functionality be added to the community submission form on the front end. Hoping at some point support for EDD is added so we can use the great functionality of Community Tickets with EDD. Hey guys! Vote on this feature that would allow you to choose different fees for different organizers. As a professional association, we would like to provide a PDF certificate to attendees with the event name and person's name in the certificate, along with the number of CPE hours the event qualifies for. This certificate should be made available in a member area specific to the user, or emailed to the registered user, but only upon check-in. This would be tremendously helpful. Thank you. At the minute community members can sell tickets to their events using paypal. It would be awesome if they could do so and receive payment through Stripe Connect. Thanks for your suggestion to have the option to use Stripe Connect (https://stripe.com/docs/connect/payments-fees) instead of PayPal Adaptive Payments. Please add your votes and comment with any use cases you’d like to share. Similar to the Attendees Report, Organizers can Print, Email and Export a csv of all Attendees. Would be great to add that same functionality on the front end for the Order Sales report so that Organizers could pull that info as needed. In the current version, the admin can collect a percentage of every ticket sold or a flat fee per event purchase (e.g., a single $2 fee to buy any number of tickets for a single event). Please add your votes if you would prefer to be able to charge a flat fee per ticket sold.